They called them: nodding seats. Because if a monk nodded off, it would be revealed that through the long and involved rituals of the mediaeval church, when he was supposed to be standing unaided, he had all along been leaning on the little fold-away seats provided for the sitting bits. As he drifted off, they would fold away with a great clatter, and the religious community would frown askance at their wayward brother in Christ. Foldaway seats are an opportunity for any artist. For the underside, when the chair is stashed away, will be plain for the world to see. And so it was that many great works of mediaeval art came to be carved in the space just underneath monks bottoms. Their humble position spared most of them. Henry VIII’s thugs missed them more than they should, and Oliver Cromwell’s round-headed yes-men were more interested in statues. If these little seats were spared, it is because they were tucked away. They were called: misericords. After the Latin, misericordia. It means pity of the heart, or act of mercy, and would surely have been sweet mercy to a brother who had been standing throughout the relentless echoing masses which must have filled so many of our churches and cathedrals from the 13th century onwards. Who could resist leaning back on the ledge surreptitiously, when no-one could possibly see? The art on them was the work of tradesmen who chose this place to record details of their lives. curiosities, little idiosyncratic portraits. When you walk into one of the 9,000 or so English churches which date from mediaeval times, the canny head for the misericords. For there you will find the work of the people. There are 66 misericords in Winchester Cathedral: not one is religious or sermonising. These are carvings made by men who would have belonged to a guild of wood carvers; their perspective would be as solid and down-to earth as the single block of oak or chestnut they used to fashion their art, a world away from the rarified background of the monk. Of course, catastrophe has claimed some misericords, despite Henry and Oliver’s bungling. In 1829 a ‘lunatic’ set a fire which destroyed most of its misericords. At Old Malton in Yorkshire, they were removed and replaced with copies. And a Victorian Dean of Chester Cathedral thought his too lewd, and had them destroyed. But more than 3,500 have survived across England. A priceless treasure trove overlooked by the great men of history. Few have a scheme. There are Green Men; there is an elephant with hooves at Exeter; there are fantastical creatures, curiosities and tales to be told. Most are random. Ripple – fives miles north of Tewksbury in Hereford and Worcester, has a set of twelve without compare. The misericords at St Mary’s Church form a calendar. A picture of what ordinary folks would have been doing , the year round, in a year in the 1300s. January shows men collecting dead boughs for firewood; February shows men hedging and ditching. In March they are sowing seed, in April scaring those persistent birds away. They are blessing the crops in May, hawking in June, celebrating Lammas Eve in July and reaping in August. And so it goes on. A perfect record, six centuries old, carved on the underside of the chairs in a Worcestershire village. And though the artists which created them knew they were destined to be obscured by monks bottoms: yet perhaps they felt such vivid, flamboyant contributions to the church’s fabric would earn them a place in Heaven. Even if they made a racket when wayward brothers nodded off. If you have time, make a cup of tea and then browse the incredible collection of misericords at misericords.org.uk. Their collection is a fantastic achievement and invaluable source. Posted in Quirks of History, UncategorizedTagged church. liturgical art, mediaeval art, mediaeval times, misericordsBookmark the permalink. Thanks 😀 I thought so. One must be well versed in monks’ bottoms, I always say. I guess it would be unholy to have religious art under their bottoms! Lovely post! Never heard of this kind of art before! The best title of a blog post I’ve read for ages! Fascinating too. Here’s a pic which might clarify, Col:.http://en.wikipedia.org/wiki/File:Choir2.jpg In truth, I have been poring at it all day. I must get a monk to demonstrate for me. The art is under the seat, I believe. I don’t think I’d get much relief from having that relief digging into me! I’m trying to imagine them all doing this in unison. Wouldn’t it have made enough noise to disrupt mass? Fascinating, Kate. Oh, yes, though I think just one could accomplish that with a noisy nodding seat, Andra! I didn’t have time, but, went to the link anyways. Fascinating. I’ve sympathy for those monks. I would have been one of them nodding off, for sure. What treasures these misericords are, Kate, and that so many have survived all these centuries astounding. Thoroughly enjoyed reading this. They are. If you are ever in Europe or Britain, they are well worth seeking out. I can imagine collecting them like a train spotter. Never knew about this or noticed them…. next time I’m in an English cathedral I will be sure to look! Do 🙂 Exeter’s pretty spectacular. But then the finest misericords pop up in the most out-of-the-way churches, RMW. Thanks for reading today and leaving a comment. My word . . . what a collection. I scrolled through those at Ripple. Wonderful. Thanks, Kate. Pleasure, Nancy. Treasure trove, indeed. Great, as usual! Another part of the history of misericords is that they were a favorite thing to “buy” by American nouveau riche when they started to collect parts of old buildings in Europe to give a hint of tradition and authenticity to their dwellings. They also collected ceilings and staircases( and someone says my souvenirs fill up the suitcase?) Hearst Castle is the best example. The misericords are in the dining room, I like them better in a church! There’ Solveig, you’ve taught me something new. I’d love to see some of those collections. I also spent a few minutes at the site, Kate. What artistry! I lament the fact that artists are no longer commissioned (en masse) for such detail. Our public buildings and churches no longer bear the exquisite detail that once was considered ordinary enough for a monk’s bottom! What a shame so many have been destroyed, but what a joy so many have been preserved. Very special. They are. Once the kids are all packed off to college in a decade or so, I shall set off on a grand tour of misericords. Great fun. 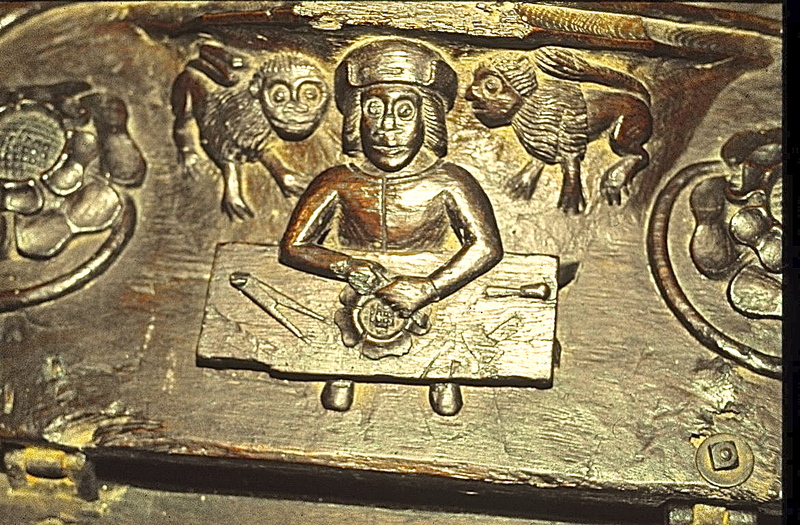 Lovely post Kate, One of the chief things I make a beeline for ,in any of my many church explorations, is to the magical and marvelous worlds contained within the misericords. Good to hear someone who knows them well! I just clicked through, they’re all so pretty! I love the way we come up with little cheats, and then more than justify them with their beauty. Unexpected art treasures. Lovely, Kate.